Oh boy, is this image heavenly! All the details and the lovely scene, so very romantic! I had a go with my Nestabilities on this card. I wanted to do more with them than just cut and then emboss the pieces. I started with embossing the front of the card itself with my largest square Nestabilities. Afterwards I made a scalloped frame into the design paper, so you could still see the embossing underneath. All borders are distressed and I added some sewing around the bgp. The cute Summer Ice Cream scene is coloured with Supracolor pens, Twinkling H2Os and Spica Glitter pens to give the final glittery touch ;) I also put some stickles on the top of the ice cream. Das Motiv ist so etwas von göttlich :) All die Details und die süße Szene, wahnsinnig romantisch! Ich wollte mal meine Nestabilities intensiver verwenden. Also nicht einfach nur damit ausschneiden und dann die Teile embossen. Also habe ich zuerst die Vorderseite des Kartenrohlings selber mit dem größten meiner Viereckigen Nestabilities embosst. Danach habe ich in das darüberliegende Designpapier einen scaloppten Rahmen gestanzt, damit man das Embossing darunter noch sehen kann. Alle Ränder sind distressed und ich habe rund um das Hintergrundpapier mit der Maschine genäht. Die total süße Summer Ice Cream Szene habe ich mit meinen Supracolor Stiften, Twinkling H2Os und Spica Glitter Stiften (für den endgültigen glitzernden Höhepunkt :) bemalt. Ich habe auch noch auf die Spitze des Eises ein wenig Stickles getan. Ich danke euch fürs Reinschaun! Paper: Stampin' Up dp "Le Jardin"
Diese neue Kollektion ist einfach zum dahinschmelzen und wenn ich Dein Kärtchen damit sehe, kann ich nur wieder ganz schwer verliebt sein. Die ist ein Traum. Die Farben und das ganze Werk, es harmoniert perfekt. Klasse. p.s love the new photo - almost didn't recognise you! Wow, forget about laundry, those stamps are amazing!! Absolutley beautiful card, love all the details! Oh My Goodness!!! She is soooo cute and adorable!!! You amaze me everytime I visit your blog Katharina!!! Your card is gorgeous! This is So Beautiful Katharina!! 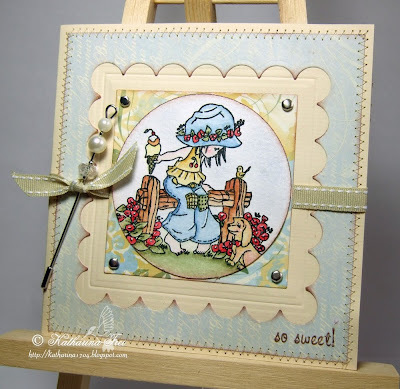 your coloring is Fabulous and the way you made this card just sets off that Adorable image wonderfully!! Oh I love this card!! I kept coming back to see if you got the stamps and I guess the wait was worth it!! I love your color choices and the embossing is gorgeous!! This is such a beautiful card!! Ja Katharina, diese neuen Motive sind einfach nur entzückend. Deine Karte ist mal wieder der Hammer geworden! Ich war leider im Krankenhaus als diese zu bestellen waren aber zum Glück werden sie ja bald nachgeliefert. Was für ein super schönes Motiv, Deine Karte ist mal wieder der Hammer. Man muß sich einfach in sie verlieben. das motiv ist wirklich total süß. die neue Kollektion gefällt mir sehr gut! Oh, Oooo..I'm in LOVE with your card Katharina, you've done your Magic once again!! wauw, this one looks great. Love the stamp. Biggest SWAP ever on my blog. I hope you will join in. wow Katharina - this are AMAZING!!! diese Karte ist ein Traum, phantastisch. Das Motiv ist aber auch der Knüller. Just simply adorable, and beautiful! This is so beautiful, Katharina!! It's lovely your card!!! we took the same stamp to start with!! ohh i love them the same image but compleatly different they just keep on coming and they are getting bigger and bigger. LOVE IT!! I am so getting these stamps when they are in again! They are beautiful to begin with, but you bring them into the realm of amazing!! Thanks so much for sharing and giving me my beauty fix!! This is just gorgeous! I love what you have done with the nestabilities. The layout is brilliant. such a pretty card! and love the new images and your gentle colouring to match the dp. Your card is simply stunning Katharina!!! YOU can't stand the waiting.....I ordered mine the minute they were up on the site and I STILL haven't gotten mine!!! Oh it's so hard living so far away!!! Hopefully they will arrive this week!!! Hugs! !